Remember expansionary fiscal contraction? You don’t hear much about it now, but back in 2010 when George Osborne set out his austerity agenda, the theory underpinning it was that the private sector would expand to fill the gaps caused by public cutbacks. The notion that too much public investment was ‘crowding out private endeavour’ was duly cited approvingly in George Osborne’s emergency budget of June 2010. An analysis of what austerity actually looks like across the English regions suggests, however, that the Conservative Party have in government been quite content to use the public finances to enable private endeavour. In the latest SPERI British Political Economy Brief, Public Infrastructure Investment and Business Activity in the English Regions, we consider a key area of government spending, infrastructure investment, and assessed its relationship with private sector business activity on a regional basis. Of course, we did not choose infrastructure investment at random in determining which area of government spending to consider. Infrastructure investment is significant because it forms a key part of the government’s ‘long term economic plan’. The Treasury’s recent Productivity Plan identified it as one of the key components for raising productivity and addressing the UK’s much-discussed ‘productivity puzzle’. Yet if the government believed the crowding out thesis (without which the economic logic of austerity would be undermined) were correct, we would expect to see those areas where the private sector is strong to have lower levels of public investment in infrastructure, and for investment to be concentrated where business activity is weakest. This would chime with the government’s stated commitment to economic rebalancing to secure growth across the whole country, and, more recently, to the ‘Northern Powerhouse’ which implies that investment in the North– away from London and the South East more generally – is an important priority. 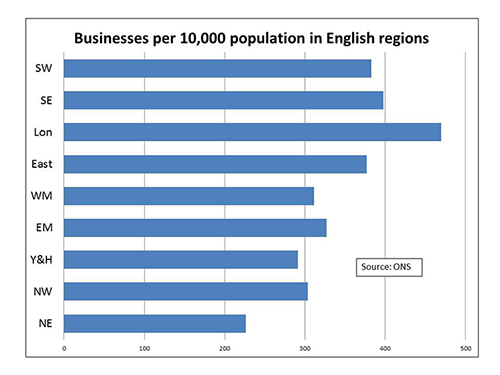 A quick look at regional business data confirms a familiar story. Private sector business activity is concentrated in the South East of England, but especially in the capital where 21% of all businesses and 27% of all start-ups are located. London has the highest rate of businesses per 10,000 residents, a start-up rate twice as fast as most other regions and is home to the most multi-million turnover businesses. By contrast, the three Northern regions have the lowest level of business activity per 10,000 residents, with the North East faring particularly badly. So London should get the lowest level of infrastructure investment, right? The actual picture doesn’t conform to crowding out theory. Our analysis of projects included in the Government’s December 2014 Infrastructure Pipeline shows that planned public infrastructure investment in London equates to £5305 per person. This is almost exactly two-thirds higher than the UK average of £3192 per person, with planned investment in every other English region significantly below the average. Investment will be £1946 per person in the North West, £851 in Yorkshire and Humberside, and just £414 in the North East (the lowest of any English region). The disproportionate level of planned public investment in infrastructure in London and the high concentration of business activity in the capital means that the assertion in the Productivity plan that ‘in recent decades the UK has relied too heavily on the capital to generate growth’ rings more than a little hollow. It is of course possible, but extremely unlikely, that the government has decided to ration infrastructure investment outside of London because it believes profoundly in the crowding out thesis, and therefore does not want public investment to inhibit a private sector-led recovery in the North. It is far more likely, however, that the crowding-out thesis is purely part of the rhetorical justification of austerity, and forms no part of the actual decisions on where the public sector should invest in infrastructure in practice. Instead, the government is content to maintain the bias of investment towards London, because it seeks to support the strong business activity that already exists in the capital. Regional inequalities in this regard are highly likely to be exacerbated, rather than alleviated, in coming years. The National Infrastructure Pipeline does not yet include the possibility of expanding Heathrow or building Crossrail 2 (a major infrastructure scheme for London which the Chancellor confirmed in the Budget is in preparation). Yet the results cited above do include plans to electrify the Trans-Pennine and Midland Mainline rail links that have subsequently been indefinitely ‘paused’. The disproportionate investment bias towards London matters for all of us in the short, medium and long-term. 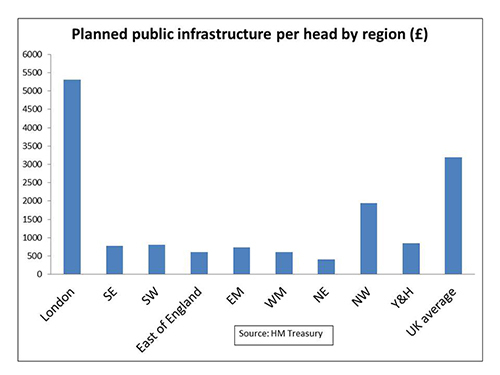 Firstly, the regional inequality in public infrastructure investment means the English regions are missing out on the short term economic boost that infrastructure investment provides. Re-orientating public investment away from London would create construction jobs and related supply-chain industries in the areas of the country that need greater private sector activity. Although High Speed 2 is a controversial form of infrastructure investment, starting construction from the North down, rather than from London up, would be an obvious ‘quick win’. In the medium term, as the government recognises, investing in the networks that underpin economic activity is an important way of improving productivity. Investing in transport, for instance, helps workers get to work quicker, and for goods to be transported more efficiently. Prioritising High Speed 3, which would better connect Northern cities, over Crossrail 2 would be a clear signal that the government is committed to the Northern Powerhouse agenda. SPERI’s previous research on rebalancing indicates the long term implications of inaction on regional inequalities. Although the London-centred nature of the UK economy was an important conditioning factor for the financial crisis of 2008, London is in fact now a larger component of the UK economy than before the crisis. The economic geography of the City of London enables it to drain resources from the rest of the country, in the process depriving households elsewhere of the disposable income upon which a consumption-led growth model depends. This leads households to depend on private debt which simply reinforces the financial services that lie behind London’s economic power. The Chancellor talks about creating a more balanced, higher productivity economy but is so far failing to deliver it. Re-orientating infrastructure investment away from London would be a step in the right direction.